My hair is going through a phase and it's not good. Specifically a dry one which is very terrible. I am sure you all know what happens to dry hair; it's more vulnerable to breakage. Some girls produce a lot of oils in their hair so they wash their hair everyday. Me, no I wash my hair every 4 to 5 days a week. But at the same time my hair does not produce oils regularly. Because of this I need to keep my hair moisturized. So trying to find moisturizing products are a little hard. Mainly because a lot of moisurizers are very stinky and greasy and that's really gross. 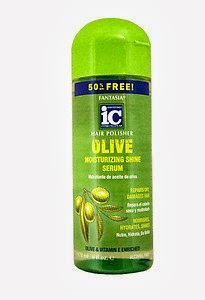 This Olive Oil Moisturizing Shine Serum works really good with keeping your hair hydrated and well nourished! I am not the only one who uses this moisturizer in my house. -Moisturizes, nourishes, hydrates, and shines. -Is Olive and Vitamin E enriched. -This works on any hair type. -Dry and frizzy hair that is chemically damaged will be moisturized and hydrated. I love this product it works really well. Like I said before, I'm not the only one who uses it in my household! Sounds great - my hair needs all the help it can get!